Plant lignocellulosic biomass, mostly composed of cell walls, is one of the largest, mostly untapped, reserves of renewable carbon feedstock on the planet. Energy-rich polysaccharide polymers of plant cell walls can be broken down to produce fermentable sugars used to produce bioethanol. However, the complex structure of plant cell walls, and in particular, the presence of lignin, makes them recalcitrant to enzymatic degradation. Reducing this recalcitrance represents a major technological challenge. Brachypodium distachyon is an excellent model to identify parameters underlying biomass quality of energy grasses. In this work, we identified a mutant line spa1 with a so far undescribed phenotype combining brittleness with increased elasticity of the internodes. Mutant cell walls contain less crystalline cellulose and changes in hemicellulose and lignin quality and quantity. Using a dedicated reactor to follow in real-time, the evolution of straw particle size and sugar release during enzymatic digestion, we show that, despite the increased lignin content, the spa1 mutant has a dramatic reduced recalcitrance to saccharification compared to the WT. 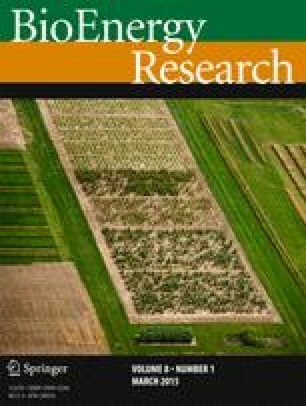 These observations demonstrate that other parameters besides lignin content are relevant for the improvement of biomass recalcitrance in energy grasses. The online version of this article (doi: 10.1007/s12155-014-9501-1) contains supplementary material, which is available to authorized users. This work was founded by the EU Framework program 7, project 211982 (Renewall) and the KBBE (2008) trilateral project “CellWall.” We thank Jacqueline Vigouroux for her help for sugar analysis, Sylvie Durand and Paul Robert for their assistance for FT-IR spectroscopy analysis and Olivier Darracq and Sébastien Antelme for taking care of the Brachypodium plants in the greenhouse. We also thank the Plateform “Chimie de Végétal (PFCV)” of the IJPB. Nuclear magnetic resonance and electron transmission microscopy were performed at the IBISA/BioGenOuest Biopolymers Structural Biology platform (BIBS, UR 1268 BIA, INRA Angers-Nantes).